Loose or uncovered cables and cords are definite trip and fall hazards. But how often have you considered what's happening to cords in your warehouse or distribution center that you have taped down to the floor, even if only temporarily? 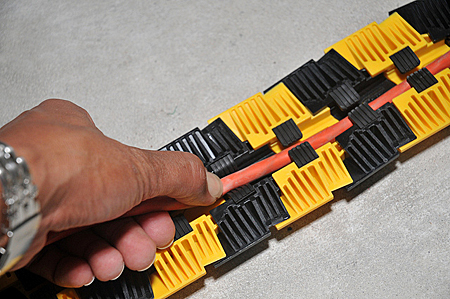 Ever thought about abrasions to those cords as they are walked on or driven over by a forklift time and again? Hiding cords and cables under rugs and mats? If you are, you're in danger of those cords causing a fire. In a warehouse or DC, fire hazards can arise when protective insulation is worn off of electrical wiring - such as can happen when repeated wear gradually eats away at the wiring covering, exposing bare wire. If positive and negative wires touch, they will spark. Get enough sparks, enough current, or something flammable near or over that spark, and you've got big trouble. 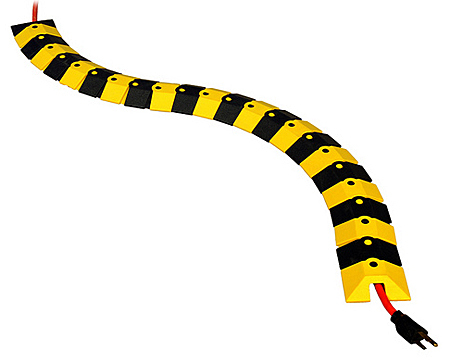 With Sidewinder Cable Protective Covers, cables and cords are never exposed to weight bearing stresses. Instead the cords are secured inside a raised well within the sturdy protective casing that makes up the Sidewinder system. Additionally, the Sidewinder can be routed in bends and curves as needed to get the cables and cords where they should be. It even stands up to forklift traffic.